Ted Cruz, a melting and radioactive potato who continues to beat the odds stacked against him by his own face and personality, has weighed in on the terrorist attacks in Brussels on Tuesday morning by helpfully declaring war. For the terrorists, the identities of the victims were irrelevant. They –we—are all part of an intolerable culture that they have vowed to destroy. Let’s return to the bolded part. “We need to empower law enforcement to patrol and secure Muslim neighborhoods before they become radicalized.” We need to identify peaceful Muslim communities and come in wearing jackboots to prevent our need to do that at a future date. We need to model violent suppression before the other side gets there first. 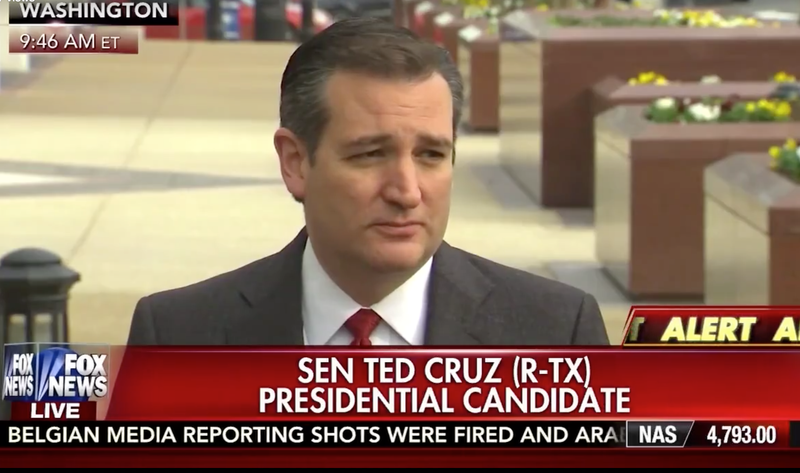 How does Ted Cruz imagine that people get radicalized in the first place? Isn’t it funny how he’s managed to convince people that he’s the less scary of the two?